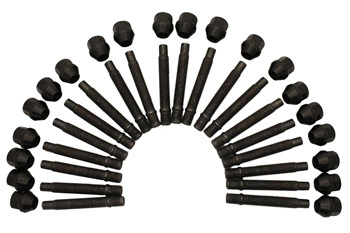 Our Stud Conversion Kits are a direct replacement for your late model BMW's factory lug bolts, made with great pride and expertise in Philadelphia USA. Many sanctioning body's and track day events require your BMW to use wheel studs, plus; it’s much easier to mount and dismount your wheels with studs rather than the cumbersome bolts. Our high grade studs are tough enough for track duty or street duty- because your BMW may be very fast and powerful, we want to offer the best product possible and manufacture these to our stringent requirements. 17mm: Ideal for OE and sports aftermarket wheels. Always installs studs into hubs using blue 'Loctite' or equivalent thread locker for your safety.